There are times when fishing that everything comes together and it all works out for the best and there are times when it doesn't. Each time out a different experience and memories made that are seldom repeated. It's a familiar catch or a long forgotten adversary or that joke that never leaves the boat. This is an account of one of those times I was lucky enough to share with some good friends. Friday came and we were finished work early, the boat was readied and packed the night before and with a stop at the grocery store for last minute supplies, we were on our way. 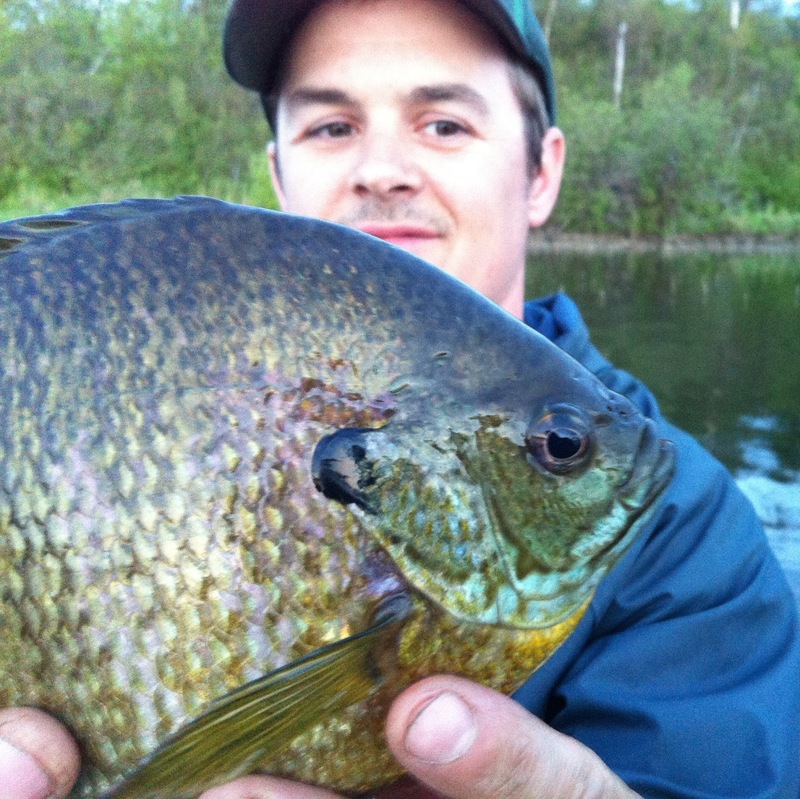 Roughly 21 hours of fishing over the next day and a half awaited us and our first target was the Bluegill. 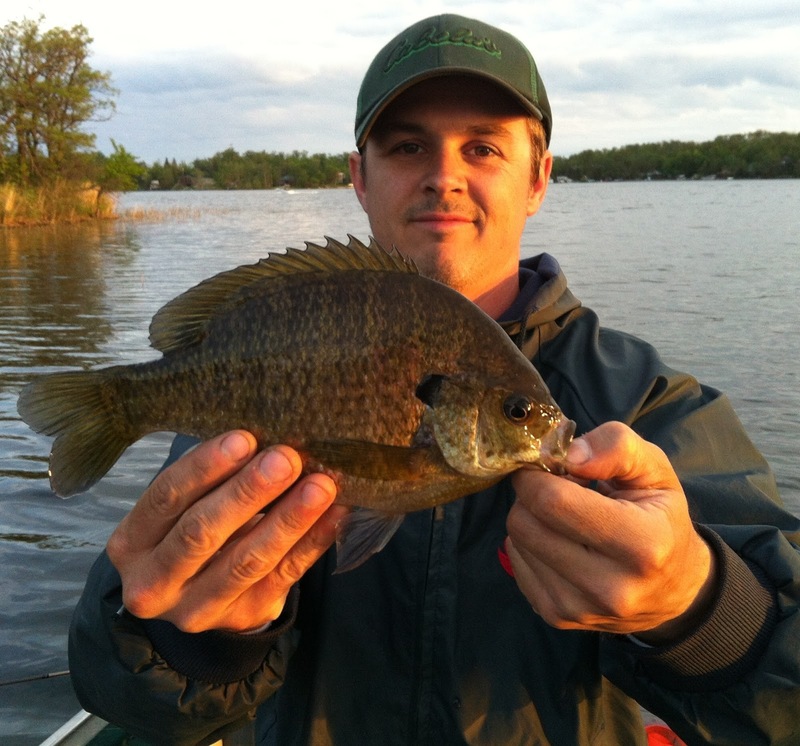 Easily targeted in the states, the Bluegill is one of my favorite fish but only a handful of water bodies inside Manitoba have a population. Along the drive we saw many hawks, a few eagles, a couple deer and a mother fox with her three kits wrestling in the ditch which only made the long journey pulling the boat into the wind more enjoyable. We arrived to our first lake and launched the boat eagerly heading off to our first spot. We were initially shocked at the water clarity not having fished this lake as early as we were before. It was early afternoon now the sun high in the sky and we were sure the fish in the shallows could see us coming before we would even cast. As we drifted into an emerging weed bed casting, I began to notice the occasional silhouette of what I first thought were Bluegills but soon saw were Black Crappie. Sight fishing for Crappie in under 4 feet of water was new to me and very exciting, but also difficult. However it wasn't long before Jay and Frodo enticed a few slabs to bite. A couple nice eaters and a pair of true trophies, we were all quite impressed. Watching these fish slurp up the lure just feet away from the boat was a treat. 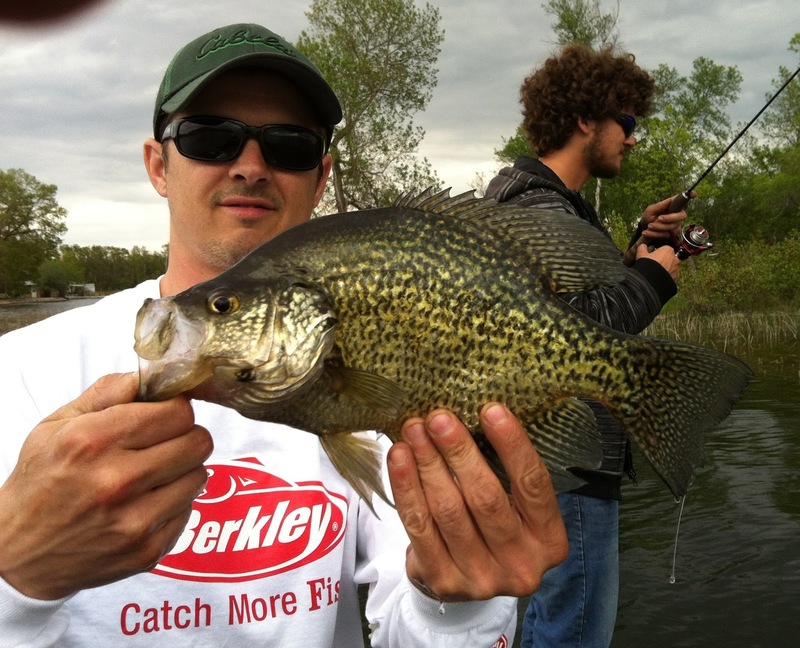 Now most folks would stick around and continue to hammer crappie but this wasn't the species we were after. We all discussed that we should go and try to locate our target species and come back to this weed bed if we were not having luck elsewhere. From spot to spot and cast to cast we went, the wind was our biggest foe and made fishing some spots with light tackle a real challenge and others outright impossible. 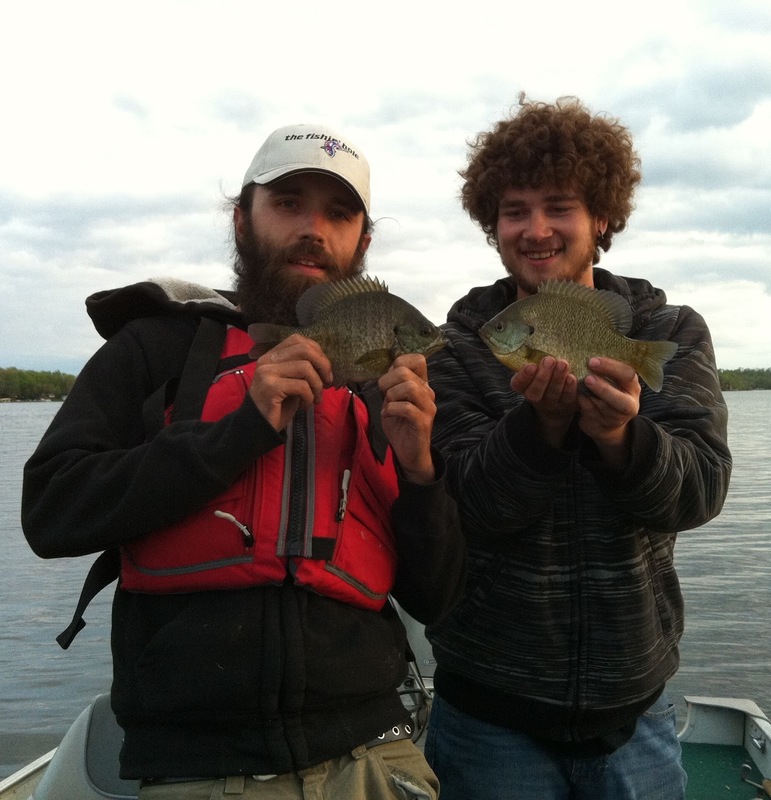 We had talked up Bluegill fishing to a friend for a while now, he had known how fun they were to catch as it was a fish often caught in his youth. It was established he hadn't fished for them in a very long time and we really wanted to get some in the boat. After many small pike and even smaller perch along with half a dozen bite offs on my part, we approached another weed bed with equal water clarity as all the ones before. The difference being, this one was holding gills and we could see them and they us. Before we could raise a rod to cast they would dart, the commotion stirring up others we hadn't seen. Fear and terror spread through the patchy pencil reeds. With so many elements against us we needed a game plan, the spotty weed patch was too tough to fish and we had spooked many gills already. The sun was slowly on it's way down and we had caught fish, but not our target species so we decided to go back to our original spot. With the light conditions changing we could possibly cast to some gills or crappie before spooking them. So off we went to where we started. We approached the weed bed with as much stealth and precision as we could, beginning another controlled drift. It wasn't long before Frodo had a fish on the end of his line and he instantly new it was a gill from the fight below the water. A huge sigh of relief followed from everyone. This was a good sign and a race against the light pushed on. About a dozen gills ended up being landed in the last 30 minutes of light, with Jay able to land his first few in years and probably a personal best as well. Not the day we set out to have but no one would complain. The diversity in colour of the bluegills, surprise sight fishing for crappie and swarms of dragonflies keeping the bugs at bay were all part of a great start to the mini weekend fishing. We loaded the boat and headed on to our next destination, a quick check on the weather app and it was clear a storm was on it's way, touching down by 3:30 am and passing along by 10. Arriving at the next lake exhausted, it was clear setting up a tent was a bad idea if the storm was to be as powerful as the radar made it look. With 5 hours to rest before sunrise we each grabbed a seat in the vehicle and tried to catch what little sleep we could, before the storm would make it near impossible.